Our intrepid bloggers have been dating for just four weeks. Everything is new. Everything is terrifying. 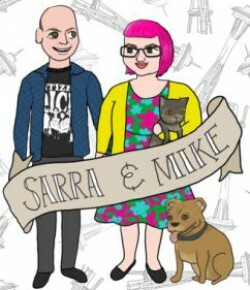 Despite the anxiety, Mike doubles down on the terror and invites Sarra to his house for a home cooked meal. Now, you have to keep in mind that at this time, Mike was still an omnivore. So, what does an omnivore that is falling madly in love with a vegan do about cooking dinner? Well, in this case, he selects the most easily veganizable dish he can think of! Vegan MoFo, Day 17: Let’s Get Boozy! We’ve both cooked with alcohol a fair bit (Mike probably more than I), but when it came down to it, there was only one choice for this prompt. We’ll make heaven a place on earth. Vegan MoFo Day 15 – Spicy! We love spicy foods! We wanted to do spicy right, so we took soup week into the soup-adjacent category, and made chili. Not just any chili, mind you, I made my famous chili verde. Read on! Since last week was taco week, we have no shortage of leftover tortillas in the house. When you’ve got leftover tortillas and it’s soup week, you make tortilla soup!